The ACX cooling array does its job admirably, if only the boosted clockspeed it aids could yield some tangible gaming gains. Nvidia upped the clocks on its cut down GK 104 and EVGA decided to go one better with the GTX 760 Superclocked. But with the reference card's GPU already hauling as much gaming load as its silicon can handle, is there any point in a more expensive overclocked version? We've already seen the standard Nvidia GeForce GTX 760 today, and there will likely be many reference versions hitting the shelves as I type, but there will also be a slew of these factory-overclocked cards. Is it worth the extra? Let's find out. 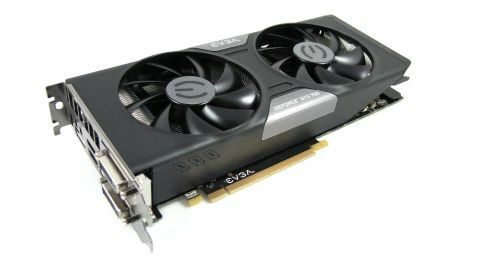 EVGA has managed to boost the performance of this Superclocked GPU by less than 100MHz compared with the reference speed. But when you're talking about 1,136MHz vs 1,215MHz once GPU Boost 2.0 gets involved, the difference becomes pretty tough to spot in terms of gaming performance. At best you're looking at an extra few frames per second on average, but rarely even that. It seems like the silicon is running at its limits at stock clocks, so any extra speed out of the GPU itself is yielding limited in-game results. The reference chip I tested also happily ran at above the out-of-the-box speed of this EVGA Superclocked card, matching whatever slight performance boost this pricier card can offer. That guaranteed boosted clockspeed is not all the EVGA card has to offer though, and arguably the extra £20 / $30 you're paying for this version of the GTX 760 could be worth it. EVGA have added their new ACX (Active Cooling Xtreme...ack) cooling array to this Superclocked card and it manages to keep the card much cooler and a bit quieter than the Nvidia reference design. It's quite subjective, but I struggled to detect a huge difference in the noise of the two cooling designs. The actual temperature results are impossible to argue against, however. EVGA's ACX array cuts the peak operating temperature by a full 10°C compared with Nvidia's setup, even running at the higher speed of this overclocked card. It does though draw a good chunk more power under 100% GPU load, however. My stock-clocked Ivy Bridge test rig was running at a peak platform load of 271 Watts with the EVGA card, but the same reference GTX 760 setup only hit 244 Watts. There are though two letters I haven't mentioned when talking about the new Nvidia mid-range, and their recent penchant for 'Ti' versions cannot be ignored. But Nvidia have taken the unprecedented step of assuring all reviewers that, with the release of the GTX 760, this is how it's going to stay 'til Autumn. They included a definitive run down of their graphics stack, deliberately stating that nothing is going to change through the Fall period. And that means there's no Ti version planned any time soon. The likelihood is the GTX 760 Ti spec is being held in reserve in case AMD do tip up with anything impressive by the end of the year, in which case Nvidia can drop a well-priced GK104 card with a hefty 1,344 cores. But that still doesn't leave the overclocked versions of the straight GTX 760 in a good place. The combination of higher price, higher operating power demands and not much in the way of performance improvements makes it tough to recommend an overclocked card like the EVGA GTX 760 Superclocked over the reference editions. The ACX chiller is impressive at dropping the temperatures and, given the limited performance advantage the overclock affords, you could even drop the clockspeed back to reference levels and run the card even cooler. If you're running a small form factor machine that could be important. But that's a fairly niche advantage and you've got to be a strong-willed kinda PC upgrader to actually cut the clockspeed of your new factory-overclocked graphics card. The rest of us though would likely be better off sticking with the cheaper stock-clocked version.